A series of explosions reportedly hit a U.S. base in Afghanistan. Taliban terrorists have taken responsibility. In an ongoing attack, Taliban fighters bombed part of a U.S. military outpost on Monday, located in the eastern Afghan province of Nangarhar near the Pakistan border. Officials say that no one was killed in the attack. BBC news reported that NATO helicopters swarmed over the base as the attack triggered a gun battle with Taliban terrorists. 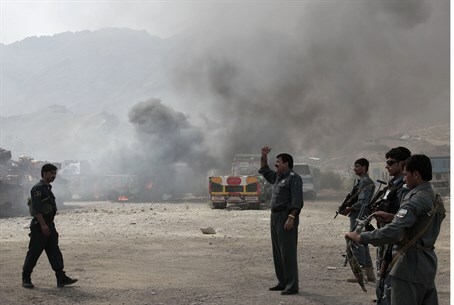 The Taliban group confessed that they were behind the attack. "In a parking lot used by Americans there was a huge blast and after that a massive attack. A number of our heroes are fighting," said Taliban spokesman Zabihullah Mujahid in an email. The targeted base itself, which houses 66,000 US troops serving in Afghanistan and military forces from other countries, is said to have not been penetrated. Part of Jalalbad-Torkham Road, a key route for NATO supply vehicles, was closed after the attack, said Ahmad Zia Abdulzai, spokesman for the Nangahar governor. The Taliban has mounted a number of attacks on Afghan security forces and civilians this week, killing dozens and adding to fears of foreign troops, most of whom are due to leave the country by the end of next year.